Most Arab nationals—about three-quarters—listen to music whether offline or online. Nearly all Emiratis listen to music compared to about half of nationals in Jordan and two-thirds of Egyptians. Interestingly, nationals are nearly as likely to listen to music online as offline, especially in the UAE, Saudi Arabia, and Qatar where online and offline listening rates are nearly identical. This represents an increase in listening to music online over the past two years in all countries except Egypt. The largest increases in online listening in 2016 were in Qatar, Lebanon, and Tunisia (24, 22, and 21 percentage-point increases, respectively). About three in 10 nationals listen to music online or offline every day. This rate is consistent across most countries but higher in Tunisia and the UAE where more than four in 10 nationals listen to music daily. Music is part of everyday life for most Arab nationals, but daily listening decreases with age. About half of 18 to 24 year-olds listen to music online and offline every day, but this rate drops to a third of 25 to 34 year-olds, a quarter of 35 to 44 year-olds, and less than two in 10 nationals 45 and older. Older nationals are more likely than their younger counterparts to listen to radio every day, however this may include content other than music (20% 18-24 year-olds, 27% 25-34 year-olds, 32% 35-44 year-olds: 36% 45+ year-olds). Education appears to play a role in music habits. Nearly four in 10 university-educated nationals listen to music online and offline daily compared to about three in 10 with a secondary education, one-quarter with an intermediate education, and less than two in 10 with a primary education or less. Arab nationals access music on multiple platforms: internet, TV, phone, and radio. However, habits are changing. Across the region, both listening to music online or on a phone rose by about 10 percentage points since 2016. At the same time, both listening to music on TV or radio dropped by 13 and 7 percentage points, respectively. 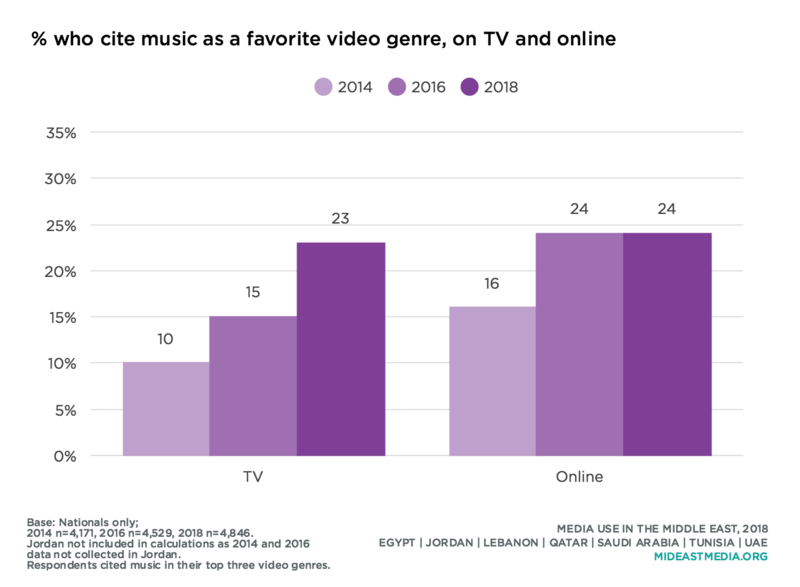 Most Emiratis and Lebanese access music on all platforms; Qataris are most likely to use the internet generally or their phones specifically; Saudis use the internet and TV most often, while Egyptians mostly access music on TV. Fewer than half of Tunisians and Jordanians use any specific platform to access music. The oldest age cohort (45+ year-olds) is more likely to access music on TV than online (49% TV vs. 22% online), while the youngest age group (18-24 year-olds) is more likely to access music online or on a phone than on TV (62% online, 57% phone vs. 49% TV). Preferences for Arab music are strong—whether the music is from one’s own country or another Arab country. 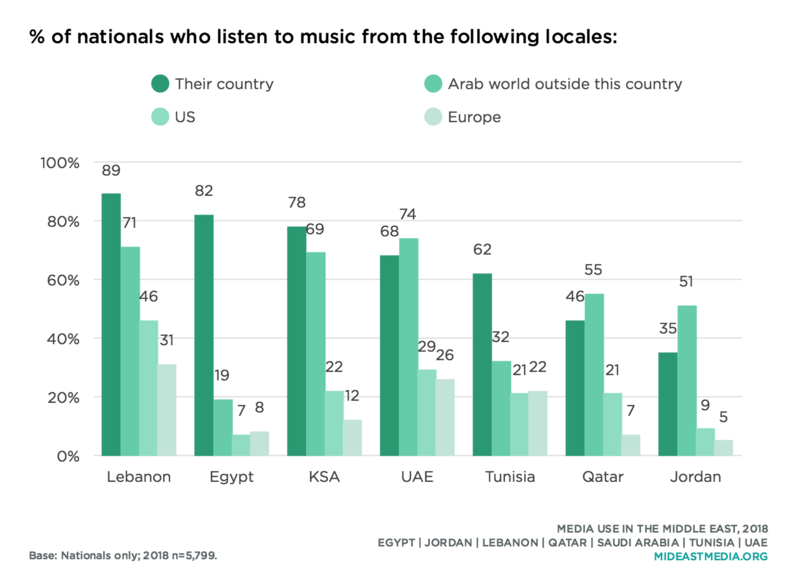 Emiratis, Qataris, and Jordanians listen to music more from other Arab countries than their own, while more Egyptians, Lebanese, Saudis, and Tunisians listen to music from their own country than from other Arab countries. 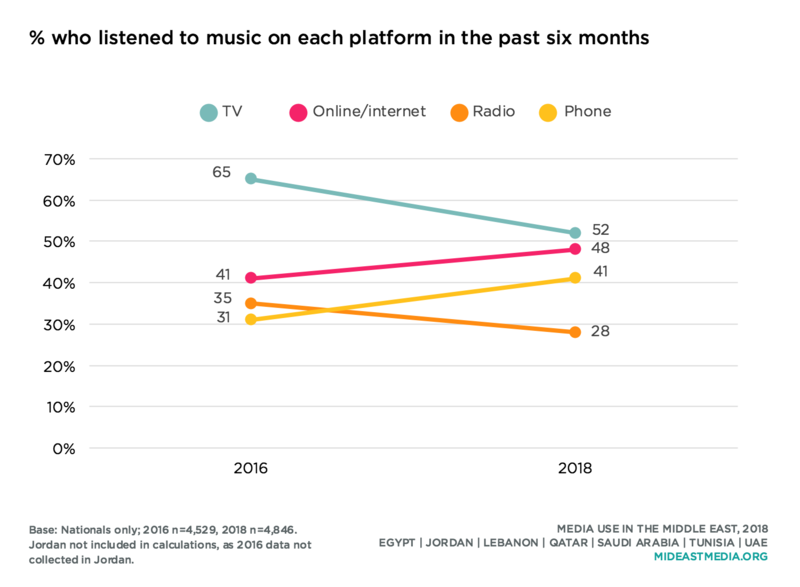 Still, a strong majority of Lebanese, Emiratis, and Saudis listen to Arab music from both inside and outside their own countries, while Egyptians listen almost exclusively to Egyptian music. More Lebanese and Emiratis listen to Western music than other nationals. Western music is less popular among Saudis, Tunisians, Qataris, and Jordanians—among whom one in five or fewer listen to music from either the U.S. or Europe—and even less popular in Egypt, where fewer than one in 10 listen to music from these locales. Both age and education are associated with preferences for music from the U.S. Three in 10 of the youngest age cohort listen to music from the U.S. compared with only one in 10 of the oldest cohort (31% 18-24 year-olds, 25% 25-34 year-olds, 19% 35-44 year-olds vs. 9% 45+ year-olds). Similarly, preference for music from the U.S. is higher among nationals with more education (2% primary or less, 10% intermediate, 24% secondary, 32% university or higher). 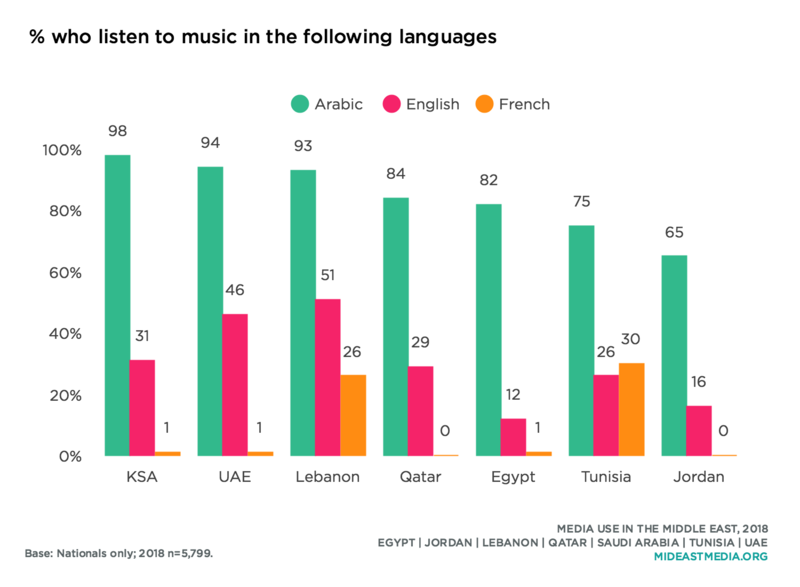 A vast majority of Arab nationals across the region listens to music in Arabic—over nine in 10 Lebanese, Saudis, and Emiratis and two-thirds or more Jordanians, Qataris, Egyptians, and Tunisians. Some nationals listen to music in English, ranging from 12% of Egyptians and 16% of Jordanians to about half of Lebanese and Emiratis. Only in Lebanon and Tunisia do some nationals listen to music in French. In Tunisia, French music is more popular than English. Listening to music in English varies modestly by gender but more so by age and education. A few more men than women listen to music in English (30% vs. 26%, respectively). However, the youngest nationals listen to music in English at over three times the rate of the oldest nationals (43% 18-24 year-olds vs. 12% 45+ year-olds), and the most educated nationals listen in English at more than 13 times the rate of the least educated (41% university or higher vs. 3% primary or less). The popularity of music videos as a favorite genre continues to increase both on TV and online. 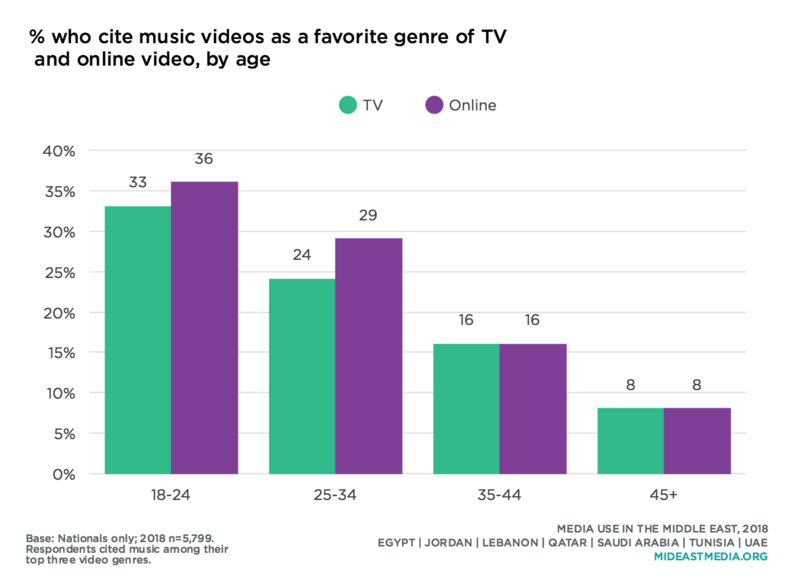 One-quarter of all Arab nationals in 2018 list music videos among their three favorite genres of TV and online video. Compared with 2014, this represents 13 and eight percentage-point increases for TV and online video, respectively. The increase in watching music videos, both on TV and online, is fueled primarily by younger respondents; about four times as many of the youngest nationals (18-24 year-olds) compared to their oldest counterparts (45+ year-olds) identify music videos as a favorite on both platforms. Of note, nationals under 35 years old are more likely to name music videos as a favorite genre of online video than for TV. 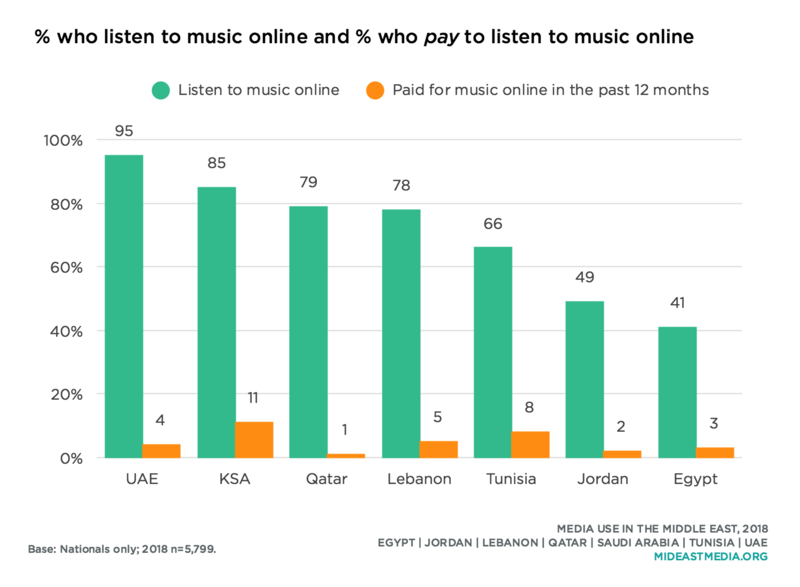 While most Arab nationals listen to music online, few pay to do so. 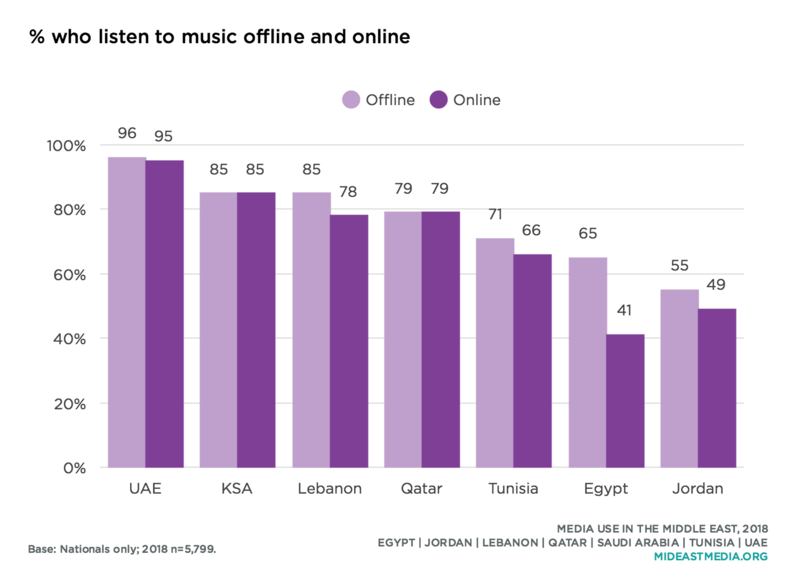 Most Arab nationals listen to music online. However, across countries, as few as 1% (Qatar) and no more than 11% (KSA) have paid to listen to music online in the past year. Younger nationals are more likely to be willing to pay and to have paid for music online, but the numbers are low even among this group (willing to pay: 11% 18-24 year-olds, 7% 25-34 year-olds, 5% 35-44 year-olds, 1% 45+ year-olds; have paid in the past 12 months: 8% 18-24 year-olds, 6% 25-34 year-olds, 5% 35-44 year-olds, 1% 45+ year-olds). 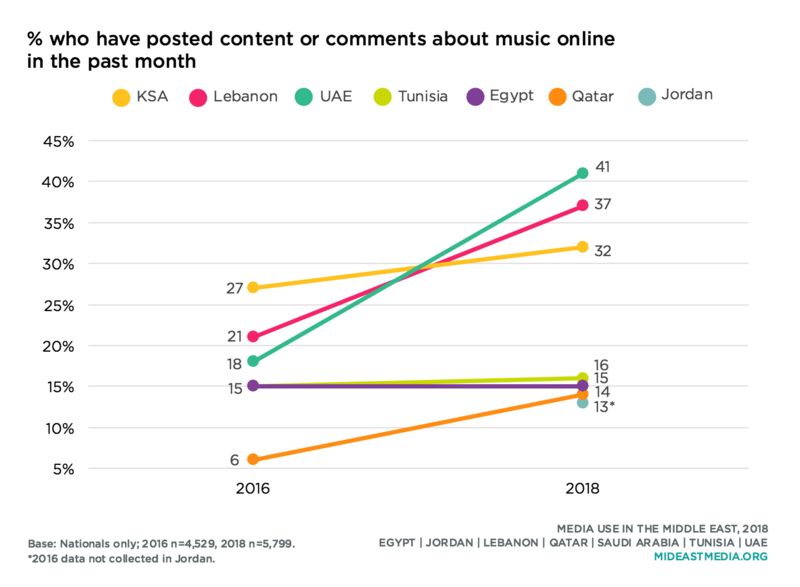 The portion of Arab nationals sending, sharing, or posting about music online in the past month grew since 2016 (24% in 2018 vs. 18% in 2016). This holds in every country except Egypt and Tunisia, where rates of posting about music remained low—about 15%—in each country. More Emiratis post about music than other nationals followed by Lebanese and Saudis (41%, 37%, 32%, respectively). The shares of both Qataris and Emiratis who post music-related content online more than doubled since 2016. Posting about music is most common among the youngest nationals and decreases with age (34% 18-24 year-olds, 28% 25-34 year-olds, 18% 35-44 year-olds, 8% 45+ year-olds). Podcasts are a common way many Arab nationals access entertainment and news. Nearly three in 10 nationals listen to podcasts. However, this average masks wide variation by country which ranges from two-thirds of Saudis and Emiratis to fewer than one in 10 Lebanese and Egyptians. Younger nationals are twice as likely to listen to podcasts as their oldest counterparts (33% 18-24 year-olds, 31% 25-34 year-olds, 23% 35-44 year-olds vs. 15% 45+ year-olds). Additionally, highly educated nationals are much more likely to listen to podcasts (36% university or higher, 29% secondary, 13% intermediate, 8% primary or less). Furthermore, expats are far more likely than nationals to listen to podcasts; 77% of Western expats use the medium compared to 28% of Arab nationals. 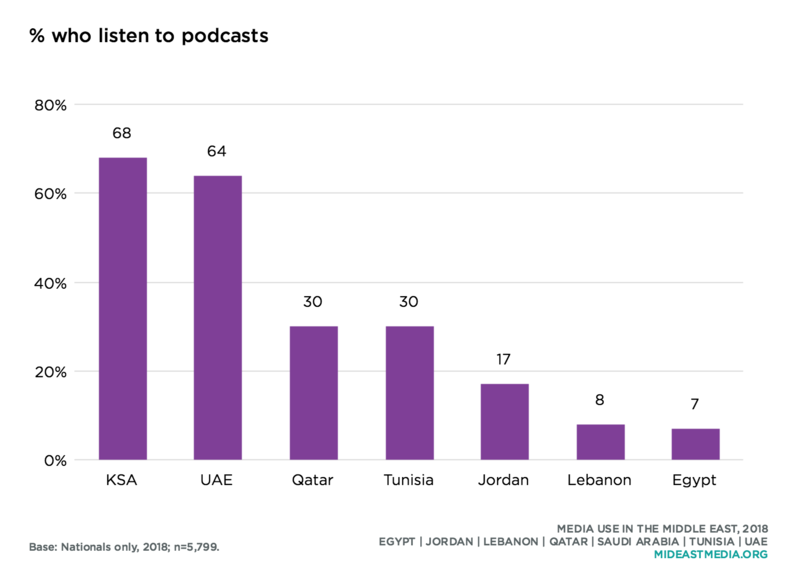 The Arabic language dominates podcasts Arab nationals listen to—eight to nine in 10 of podcast users in the UAE, Egypt, Qatar, Saudi Arabia, and Jordan listen in Arabic. Half of Lebanese, four in 10 Emiratis, and three in 10 Qataris listen to English podcasts. Lebanese nationals listen almost equally in Arabic and English, with English having the slight edge. 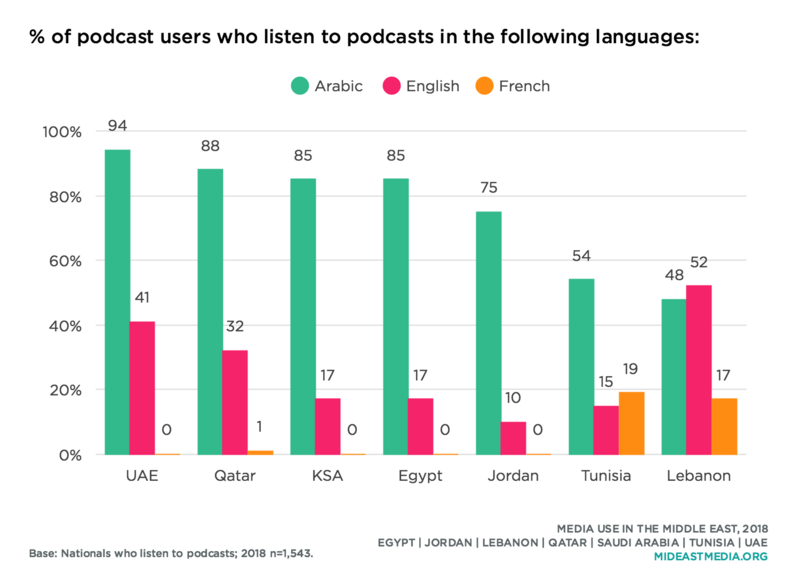 About one in five Tunisian and Lebanese podcast users listen in French. Podcasts are one of the few areas with similar preferences across age groups. 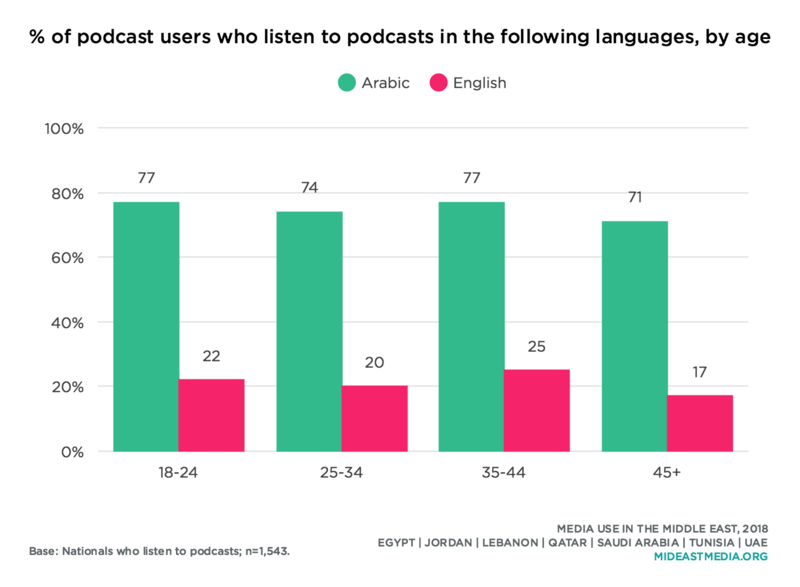 About three-quarters of Arab nationals of all ages who listen to podcasts do so in Arabic and about one-fifth across age groups listen in English. In contrast, university-educated nationals who listen to podcasts are two to five times more likely to listen in English than any other group (30% university or higher vs. 16% secondary, 13% intermediate, 6% primary or less). The podcasts Arab nationals listen to originate mostly from their own country or elsewhere in the Arab region. Lebanese listen to the most diverse set of podcasts; more than four in 10 originate from either Lebanon or the U.S. and about a third each from other Arab states or Europe. Listening to Western podcasts is least common in Egypt, Jordan, and Tunisia. 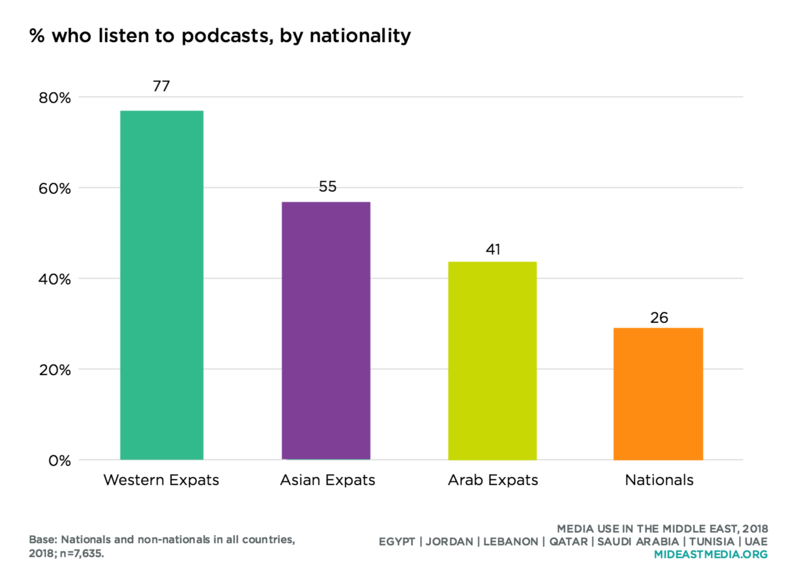 In fact, Egyptian and Tunisian podcast users listen almost exclusively to podcasts originating from their own country. 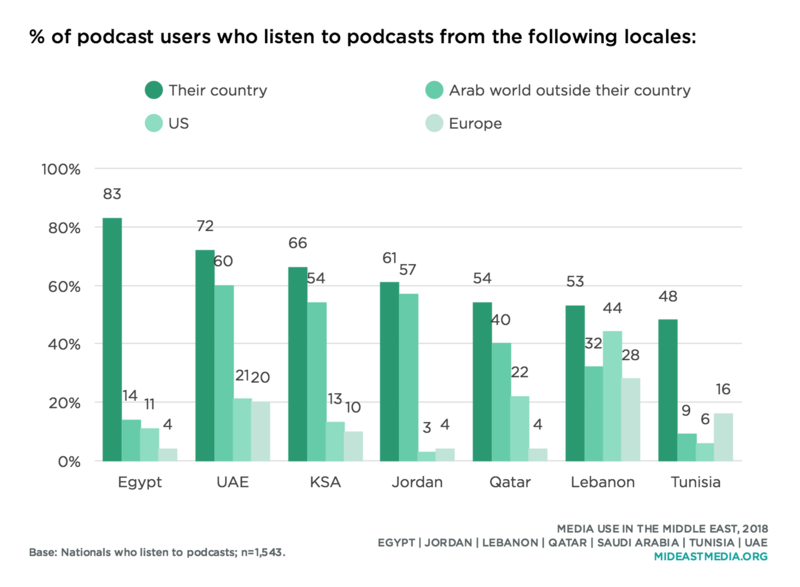 Among podcast users, more men than women listen to podcasts from outside their country, while women are more likely to listen to podcasts from within their country (Arab world outside this country: 42% men vs. 37% women; this country: 64% women vs. 59% men). Both genders listen to podcasts from the U.S. and Europe in roughly the same proportions. Arab nationals across age groups listen to podcasts from their own country in equal proportions—about six in 10. Younger nationals, though, are more likely to listen to podcasts that originate outside their country (Arab world outside their country: 44% 18-24 year-olds, 43% 25-34 year-olds, 31% 35-44 year-olds, 33% 45+ year-olds; U.S.: 14%, 14%, 15%, 8%, among podcast users). The likelihood of listening to podcasts from each locale rises with education level (their country: 53% primary or less, 56% intermediate, 60% secondary, 65% university or higher; Arab world outside their country: 23%, 14%, 41%, 45%; U.S.: 3%, 4%,11%, 19%, among podcast users). Perhaps not surprisingly, majorities of Western expatriates who are podcast users listen to podcasts from the U.S. and Europe (74% and 58%, respectively).